Peter Pincus uses a method that creates surface pattern as the first part of his making process. The process starts with dying casting slips. 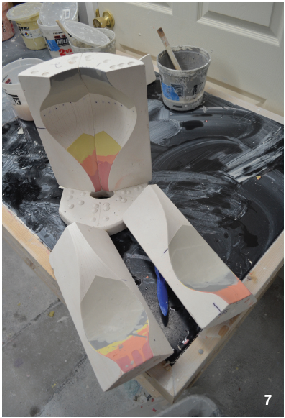 Slip is then painted onto a plaster mold using a brush, and when dry trimmed to the desired shape. The excess is peeled off and the neighboring color is painted on. This trimming peeling and layer process is continued until the surface design is completed. Casting slip is then poured into the mold to finish creating the form and to hold the pieces together.